CAL uses a TSI Handheld Particle Counter 9306-V2 to undertake these Pollution Checks. Full specification details are attached below. The Aerotrak 9306-V2 measures the number of particles per cubic metre between different diameters in microns. CAL has chosen diameters of: 0.3; 0.4; 0.5; 1.0; 2.5; and 10.0 microns. The Pollution Check is undertaken for one minute and shows the average number of particles per cubic metre between say 0.3 and 0.4 microns in diameter and finally for 10.0 microns and above. These appear as one number at each of say 0.3 and 10.0 respectively. CAL has chosen 2.5 microns and 10.0 microns because of their direct relevance for health guidelines and legal limits. The smaller sizes are chosen to measure the smallest particles possible with the Aerotrak 9306-V2. The tweeted Pollution Check shows the cumulative total number of particles per cubic metre of 0.3 microns in diameter or greater. Also tweeted are time, temperature and relative humidity. People ask what is the ‘safe’ level? The answer is that no safe level has been identified for human exposure to dangerous airborne particles. Typically, particles less than 10 microns can be inhaled and those smaller than 2.5 microns can enter the lungs and bloodstream. Scientific research has shown a better association between cardiovascular mortality and the previous day particle concentrations than other metrics. A summary of research is attached below. CAL is able to convert the particle number concentrations into a particle mass concentration by assuming the particles are spherical with a density of between 1.0 and 1.5 times the density of water. The mass concentration can be used to make approximations with health guidelines and legal limits. CAL undertakes Pollution Checks at different locations to assess indoor and outdoor air quality. In general, CAL prefers to take readings at different locations on the same day and present the results in graphical form. In part, this is because air pollution can vary considerably from day to day due to weather and other factors e.g. traffic congestion. For more details about air pollution in London please visit the excellent London Air Quality Network at www.londonair.org.uk or airTEXT at www.airtext.info. 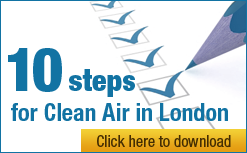 Examples of Pollution Checks are shown on CAL’s website. For more details, please check CAL via Twitter or its website.